Whitefish Group Campground was developed primarily to accommodate organized youth and special groups up to 40 individuals with basic amenities. Organized groups which are larger than this may use the campground, but will have to split up into smaller groups, utilizing more than one site. Adult groups such as family reunions and clubs may book into the campground but youth and special groups have booking priority. (b) sponsored by a non-profit, religious, charitable or educational organization. residents in training centres, training schools or correctional centres administered by the Ministry of Public Safety and Security or Ministry of Community, Family and Children's Services. Whitefish Group Campground is open from late April to Thanksgiving. Algonquin Park Services is responsible for the operation and maintanence of the campground under contract to Ontario Parks. Permits for the Whitefish Group Campground are issued at the Pog Lake Campground Office located at the entrnace to Whitefish Group Campground. See the Pog Lake Campground webpage for campground office operating dates and hours. 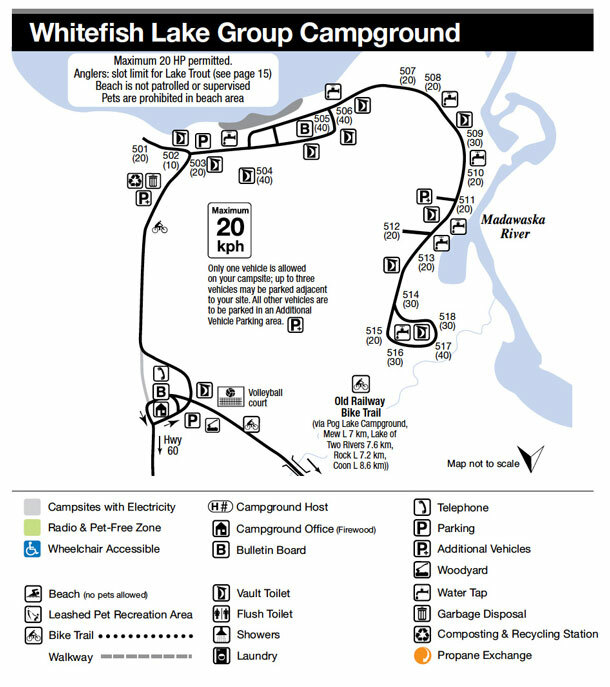 Below is a current map of the Whitefish Lake Group Campground for trip planning purposes. Click to enlarge the map. Whitefish Lake Group Campground reservations can only be made by the following methods. Online at www.ontarioparks.com by selecting Group as your Reservation Type, and Algonquin as Pick your park and/or campground. By telephone at 1-888-ONT-PARK (1-888-668-7275) or 519-826-5290 outside North America. In person, first-come, first-served, reservations will still be permitted for the Whitefish Lake Group Campground during the operating dates of the campground.